There is nothing quite like a fifties convertible especially when it is like this 1955 Ford Fairlane Sunliner. Completely redesigned for 1955, Fords looked fresh and exciting ready to embrace the fins and chrome era. Ford offered three series in 1955: Mainline, Customline and Fairlane with the latter replacing the Crestline as the top trim level. The Fairlane featured a distinctive side trim that ran from the top of the front fender, dipped down to form a "V" and continued to the taillights. At the rear there was now a tail fin that mimicked what was on the popular Thunderbird and it also shared its taillights. Snowshoe White over Torch Red is an excellent and desirable color combination. The Astra-Dial speedometer featured a transparent hood for better visibility during the daytime and was a carry over from 1954. It was a cool idea in principal but wasn't popular and this was the last year it was to be used. The rest of the instrument panel was brand new for '55. 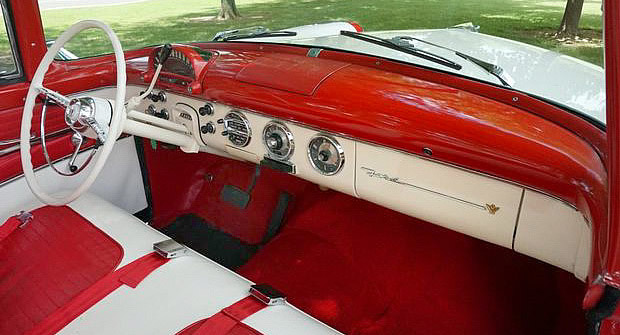 Seating and door panels are all-vinyl, two-tone red and white. Horsepower was up this year on the base V8 engine. 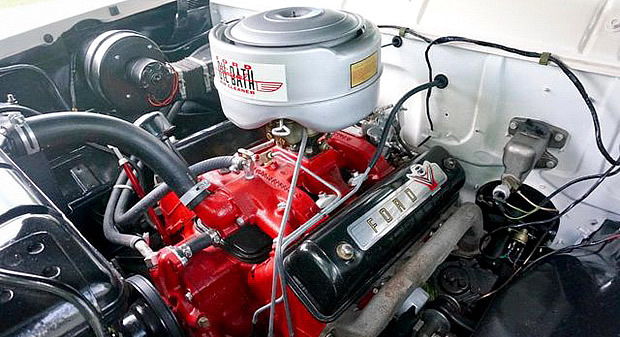 The old 239 cubic inch V8 was bored out to 272 cubic inches taking the horsepower from 130 to 162. This came with a 3-speed manual transmission as standard although this car is fitted with a Ford-O-Matic Drive automatic transmission - a $178 option at the time. This particular Sunliner was made in the Memphis, Tennessee plant and had the following options when it was originally built: Magic Aire heater and defroster ($71), electric clock ($15), AM radio ($99). Prices in brackets indicate the original option cost when the car was first ordered. ​Ford sold a total of 49,966 Fairlane Sunliners during the 1955 model year. Prices started at $2,224 for the six cylinder and $2324 for the base V8. 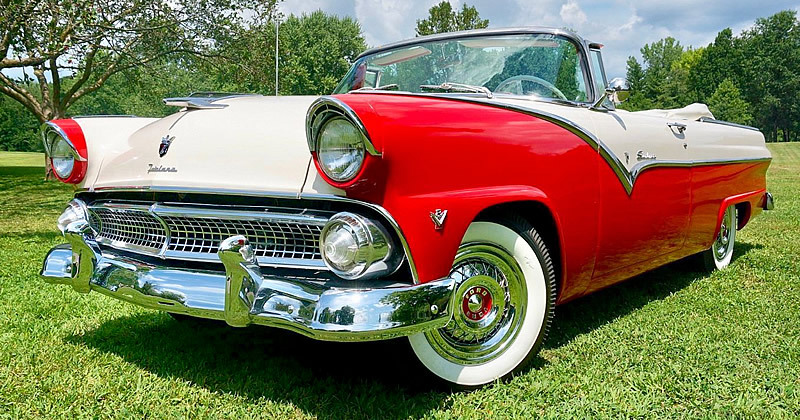 In total Ford sold 645,250 Fairlanes that year, which compared to the 254,767 Crestlines sold the year before, was proof how well received these new cars were.